Our church is a branch of The First Church of Christ, Scientist in Boston Massachusetts, also known as The Mother Church. We are located in Eastern Connecticut at 870 Main Street in Willimantic near Eastern Connecticut State University, the University of Connecticut and Quinebaug Valley Community College. There is easy on street parking and a public parking lot within a half block of the church. All are welcome at our Sunday and Wednesday services and are welcome to use the services of our Reading Room. You are welcome to participate in our Wednesday meeting or Sunday service by telephone if you can not join us at our church. Please call 712-770-5505. When you hear the instructions enter 714872#. It is not necessary to announce yourself. It is advisable to mute your phone immediately. We do hope you can join us at our church but we welcome your participation by this media when this is not possible. Buildings of great cultural significance, like the Acropolis in Athens, draw visitors from around the world to admire their historical importance, as well as their beauty and ingenuity. I love seeing the Acropolis every time I go home to Athens, but what’s really captured my attention is the careful restoration of its monuments. Restoration is a theme that most of us can relate to. Whether it’s the restoration of a relationship, financial restoration after a hardship, or a restoration of our bodies, the desire to bring some aspect of our lives back to wholeness is a fairly universal one. But is restoration always possible? And if so, how? Through my study of the Bible and Science and Health with Key to the Scriptures by Mary Baker Eddy-the textbook of Christian Science, which has helped me understand the practicality and spiritual significance of the Bible-I’ve learned that the restoration of our bodies and lives is actually completely natural. Yet unlike the restoration of the Acropolis, this spiritual restoration-the regeneration of our lives through the power of God-is not the effort to bring back an object to a close version of its original. Instead, the divine healing method that restores lives is a spiritual awakening. This holy inspiration does not restore us from a lost state; instead, it is the revelation that we can never lose what our divine, loving Father gives us: health, wholeness, peace. In this lecture, I’ll share healings from my own life that shed more light on this spiritual approach to restoration, and on the system of healing that allows each of us to feel more of the regenerating power of God in our lives: Christian Science. Our Sunday service includes congregational singing, a vocal solo, organ music, silent and collective prayer, the audible praying of the Lord’s Prayer, Scriptural reading, and a collection. The Lesson-Sermon is outlined in the Christian Science Quarterly, a periodical which may be obtained from a Christian Science Reading Room, or ordered by mail, phone, or through the Internet. Two Readers elected from our membership conduct the Sunday services. One reads passages from the Bible. The other reads passages from the Christian Science textbook, which explain the Bible passages. This textbook, Science and Health with Key to the Scriptures was written by Mary Baker Eddy, the discoverer and founder of Christian Science. In order to move away from personal preaching, Mrs. Eddy ordained these two books to be the pastor of the Church. There is no ordained clergy. Every Sunday, in Christian Science churches throughout the world, the service is based on the Lesson-Sermon for that week. You may listen to the audio of a Sunday Service from the Mother Church by clicking here. Young people up to the age of twenty are welcome to attend our Sunday School. Students concerned about identity, relationships, and peer pressure find answers to these and other questions. They study the Bible, and the Lesson-Sermon. They also study the Ten Commandments, the Beatitudes, the Lord’s Prayer and the Sermon on the Mount. Their study and class discussions give them the tools they need to meet the many challenges faced by young people today. The Wednesday service and also the Thanksgiving Day service includes hymns, silent prayer, readings from the Bible and Science and Health, and testimonies from the congregation. The service is sometimes called a Wednesday Testimony Meeting, because there is a time during which individuals may share their experiences, testimonies of healing and remarks on Christian Science. There is no collection, and all are invited to attend. Child care for the very young is provided free of charge, under the care and supervision of an experienced adult. Infants and children who are too young to attend Sunday School are lovingly cared for. They may be brought 10 minutes before the start of either the Wednesday or Sunday services. You are welcome to visit our public Reading Room. 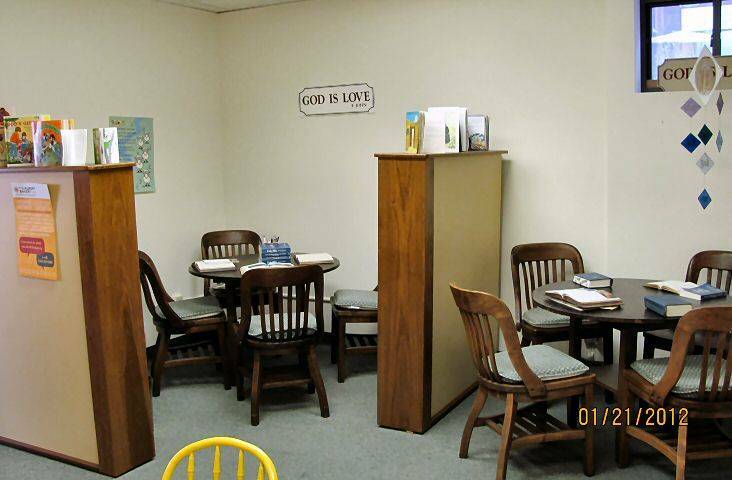 A Christian Science Reading Room is a place where people can come to inquire about Christian Science and find practical spiritual inspiration to help with life’s challenges. 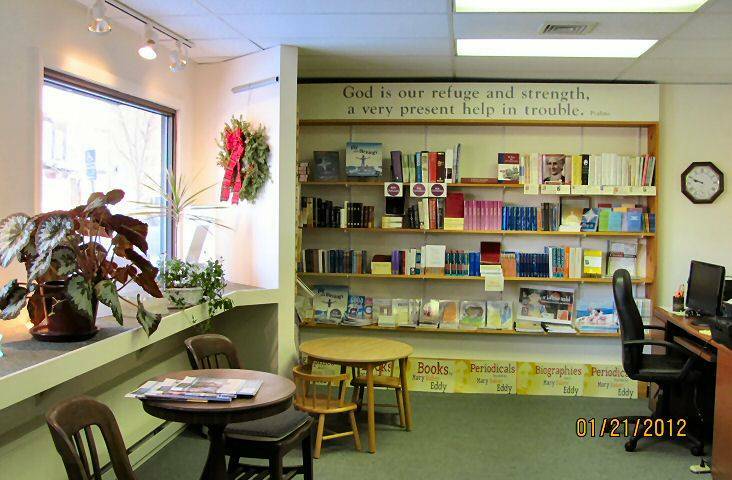 It’s also a place to read, borrow or purchase literature on Christian Science. Bibles, Science and Health with Key to the Scriptures, by Mary Baker Eddy. Periodicals, concordances, and other study reference tools may be found here. A computer is also available with Concord, a computerized concordance to the King James Version of the Bible and the published writings of Mary Baker Eddy. Visitors may use it to quickly find or print any desired information from the Bible, or the writings of Mary Baker Eddy. 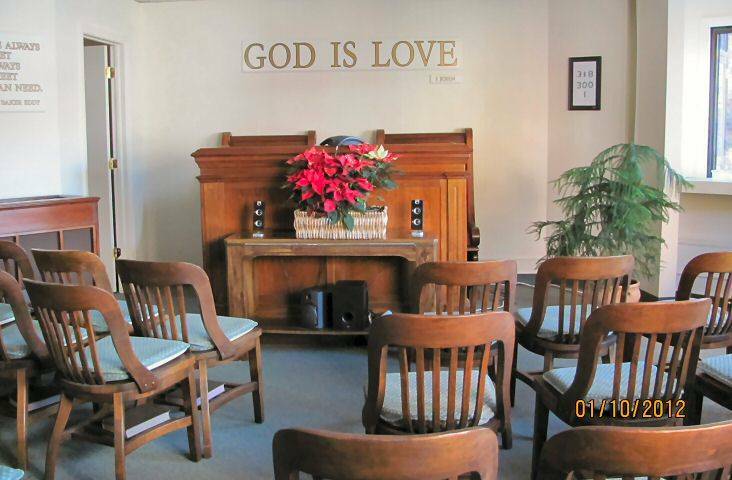 Our Reading Room is located at 870 Main Street. All are welcome to visit. This resource, mybiblelesson.com, with online and personal computer access at our Reading Room is an inspiring and useful Bible study service for youth (and youthful thinkers) from The Christian Science Publishing Society. The Christian Science Sentinel Radio Edition is a weekly radio program broadcast around the world and released monthly on CD. It includes insightful interviews and inspiring discussions on how God’s laws apply to current events and individual challenges today.